This report outlines the results of Healthify’s client surveys. The survey will help to present evidence of how Healthify’s corporate massage program has had a positive impact on the staff members and hence overall business. -Comparative of popularity and benefits of different workplace activities with corporate massage. -Level of satisfaction of service received. -The participant’s perception of the program within the business. 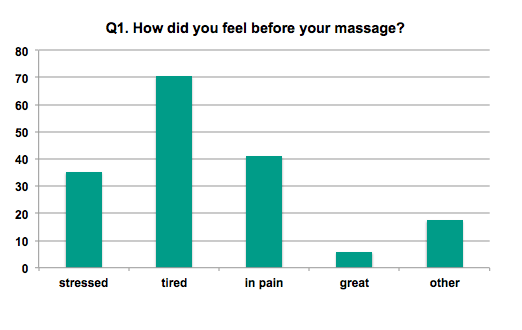 There is a major difference in the participant’s overall feeling pre and post massage which can clearly demonstrate certain benefits of corporate massage such as an increase in productivity. Corporate massage is one of the most popular activities in the workplace and has a positive impact on its employees. This generates a positive image for the company and makes the employees feel like they are cared for which then positively influence their quality of work. 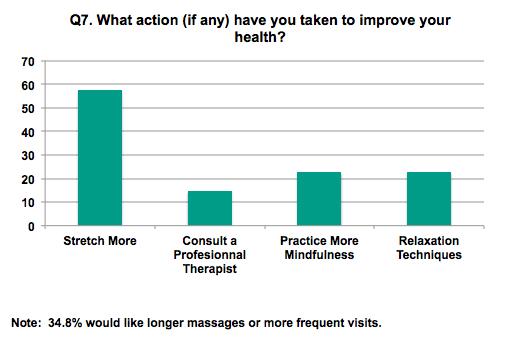 A majority of participants have started to gain an interest and learn about their own health and wellbeing since the implementation of the corporate massage program. More importantly, they have taken concrete steps to improve their health and wellbeing both at work and at home. The how include: the link between stress and muscle tension, be more aware of posture at work and at home, identify the tense muscle and apply appropriate stretches, ask questions about my pain and understand its source, how exercise can help me and how everything is connected, better awareness of areas of tension to address with self massage between sessions, visit a professional to address my musculoskeletal issues, ergonomic knowledge, better understanding of the muscular system, and postural and self massage tricks. Curious how corporate massage could benefit your workplace? Why not book a FREE corporate massage trial!